Over the last two decades, more than half of humanity has seen its daily life profoundly changed by the emergence of new technologies. The Internet and digital technologies are not only central to the lives of billions of people, but also critical to the functioning of entire societies, states and economies. We now live in a world shaped by digital connections. This multi-faceted digital transformation entails profound changes, offering many new opportunities – for enlightenment, collaboration and prosperity. But it also brings considerable challenges, not least for the functioning of rules-based democracies. Genuinely understanding this transformation and creating the best possible springboard for global prosperity and security will require engagement on an international scale in a multi-stakeholder discussion, bringing together states, local authorities, international organizations, large and small companies, citizens and NGOs. Core to this discussion must be an examination of three key questions: how the latest digital technologies – including artificial intelligence, machine learning and the internet of things – should be governed; how the technology-empowered transformation impacts on the relationships between the state and citizens; and how public services should be delivered in future. This is the aim of Paris Digital Week. For the first time, major thinkers, innovators, decision-makers and investors will gather to participate in a global discussion on current and future digital issues, hopefully easing the way to create the right regulatory foundations for a future market. When? From November 11-13, 2018. What is it? 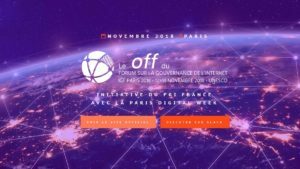 Inspired by the spirit of COP 21, the Paris Peace Forum aims to become the annual meeting point for global governance, including digital spaces. Thousands of participants from around the world are expected. 120 innovative projects will be presented in the “solutions area”, after an inauguration by President Chancellor Angela Merkel and the UN Secretary-General, Antonio Guterres, before an audience of sixty heads of state and government. Where? At Paris City Hall, Paris 4th. What is it? The first summit of its kind entirely dedicated to the digital transformation of states and democracies will bring together European innovators and decision-makers, investors,academics, governments and local authorities, as well as members of civil society, to imagine the future of digital government. The summit will focus on ways to support the emergence of a European ecosystem of innovators, showcasing solutions, helping institutions to improve the use of new technologies in the public sector and encourage the collaboration between states and startups. Alongside the summit, the French President Emmanuel Macron will host leading thinkers on the digital transformation of democracies for a lunch on 12th November at the Elysee Palace around the theme “Technology and the Future of Democracy and Government”.